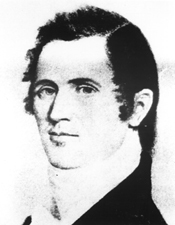 KANE, Elias Kent, a Senator from Illinois; born in New York City on June 7, 1794; attended the public schools; graduated from Yale College in 1813; studied law; admitted to the bar and commenced practice in Nashville, Tenn.; moved to Kaskaskia, Ill., in 1814; appointed judge of the Territory of Illinois; delegate to the first State constitutional convention in 1818; unsuccessful candidate for election in 1820 to the Seventeenth Congress; first secretary of State of Illinois 1820-1824; member, State house of representatives 1824; elected to the United States Senate in 1824; reelected in 1831 and served from March 4, 1825, until his death in Washington, D.C., December 12, 1835; chairman, Committee to Audit and Control the Contingent Expenses (Nineteenth through Twenty-first Congresses), Committee on Private Land Claims (Twenty-first through Twenty-third Congresses), Committee on Public Lands (Twenty-second Congress); interment in the family cemetery on the old Kane farm, near Fort Gage, Ill.
Hubbs, Barbara Burr. Father of Illinois ConstitutionElias Kent Kane. In Idols of Egypt, edited by Will Griffith, pp. 77-92. Carbondale, IL: Egypt Book House, 1947.